At Dragon on the Lake, we’ve given special attention to those whose lives have been touched by cancer. The cancer survivor division at Dragon on the Lake allows teams to raise awareness and funds for the cause. We believe that working as a team can have a powerful impact on healing to provide emotional support and wellness. 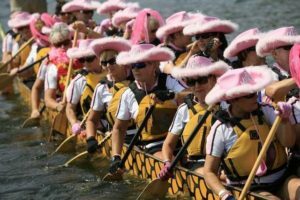 The Orion Art Center, which produces Dragon on the Lake, has been proud to donate a portion of the proceeds from the Dragon Boat Races to Cancer research and awareness. On Sunday at 12:15 at Green’s Park, we’ll have a special flower ceremony to celebrate the lives of survivors, offer hope to those still battling the disease, and honor those who have lost their fight.